Archives for May 2017 | Evelyn Mc Marketing! 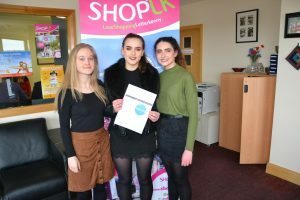 Hello everyone, Shannon Thackrah- Evelyn’s 3rd year Digital Marketing work placement student from IT Sligo, here to tell you about my marketing work experience I had with Evelyn Mc Marketing. Unfortunately my time with Evelyn has come to a close- where did the time go?! I was on work placement with Evelyn from the end of January until now and honestly the time flew by. I am amazed at how much we managed to achieve together during my marketing placement time and how beneficial this work placement has been to me. Over the course of my work placement I learned new skills, put my existing skills into practise in real life situations and also was able to develop personal skills such as networking and becoming more self-confident in myself and my abilities as a marketer. One thing I loved about my placement with Evelyn was how energetic she was and how infectious her enthusiasm, about every project is. We would come up with an idea and she would already be so excited that it was hard not to also be excited and looking forward to carrying the project out. Work placement with Evelyn was also great for networking. I got to go to so many events and meet so many wonderful and inspiring business and marketing people and talk to them about their industry and marketing. 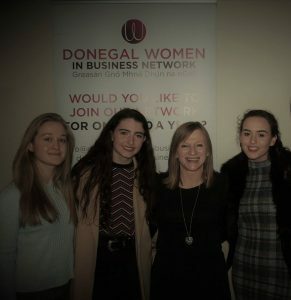 I really loved going to the Donegal Women In Business events too as there was such a wonderful positive and encouraging atmosphere and everyone was so interesting to talk to. Phew! What a great project to have been a part of and it feels amazing to think we achieved so much in such little amount of time. Also as part of my work placement I was able to build upon my graphic design and Photoshop skills. These were crucial in most stages of my placement but especially when designing content for some clients and especially the Reveal The Teen project. Another area I was able to build upon was my web design and general website knowledge and skills. Both of those areas were areas that prior to the placement I felt were not very developed but now after having built upon those skills I feel wholly confident that I am capable in those areas now! It was also great to develop my social and blog content creation skills as I was able to suggest social media post ideas and was able to write a few blog posts for Evelyn’s site (such as Reveal the Teen and Top 5 Free Digital Marketing Tools) which I really enjoyed doing. Evelyn is also an incredibly warm, bubbly and friendly person. I felt so welcomed and never felt stupid asking for Evelyn to explain anything I did not understand. I highly recommend any third level marketing or business students to look for placement with Evelyn, not only will you gain great marketing and public relations experience in a multitude of areas and meet great business people at networking events but you will also have lots of fun and enjoy it!